The Audiobook version of The Walker on the Cape is here!! The first book in the Sgt. Windflower Mysteries is now available in an audiobook version. Narrated by Frank Kearney it is a completely different experience. One you won’t want to miss. The first draft of Book 8 in the Sgt. Windflower Mystery Series is done. Put “The End” on it and sent it off to the story editor. Many changes to come but soon it will be over to the wonderful beta readers. It will be published in the early Fall by Ottawa Press and Publishing. I will be at Chapters Gloucester in Ottawa on March 30 from 1-3-m. This replaces a storm cancellation day in February, If you’re in the east end of Ottawa that day, come by and say hi. I will be in Kingston, Ontario at the brand-new Indigo store on Saturday April 13 from 12-2 p.m. More details to follow. I will be in Belleville Chapters too, From 2-4 pm Saturday May 4. More details to follow. Don’t forget to pick up your copy of the latest Sgt. Windflower Mystery. Darkest Before the Dawn. 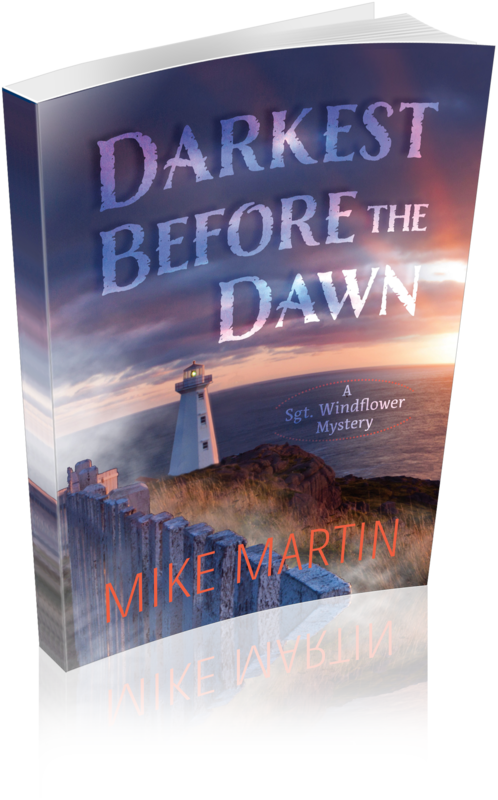 Darkest Before the Dawn is available in many bookstores across Canada including Chapters/Indigo and many independent stores. Lots of exciting things happening at Sgt. Windflower Mysteries including a new Audiobook version of The Walker on the Cape. Plus a new Windflower mystery is brewing, a special project is underway and more Book Events. In the final stages and soon to released is an audiobook version of the first book in the Sgt. Windflower Mystery Series, The Walker on the Cape. Narrated by Frank Kearney, here is a sample. Let us know what you think. Book 8 in the Sgt. Windflower Mystery Series is well underway. Up to Chapter 42 right now. Should have a first draft ready for beta readers in the Spring. It will be published in the early Fall by Ottawa Press and Publishing. Happy New Year from Sgt. Windflower Mysteries. We’re kicking off the new year with events in Toronto and Ottawa, including book signings at Chapters Gloucester and Coles Carlingwood. I will be joining a group of members of Crime Writers of Canada to make a presentation at the 2019 OLA Super Conference. The event will take place at the Metro Toronto Conference Centre on Friday February 1, 2019 from 1-2 p.m.
Watch for Kingston and Belleville events coming soon!! Three new great reviews came in for Darkest Before the Dawn, the new Sgt. Windflower Mystery. Links are below. Update on the 6th Annual Windflower Holiday Book Sale. Our initial $500 donation is on its way to the Minwaashin Lodge in Ottawa. See below for how you can participate. Minwaashin Lodge is a healing centre in Ottawa that provides a range of programs and services to First Nations, Inuit and Metis women and children who are survivors of domestic and other forms of violence, and who may also be suffering the effects of the residential school system. Canadian donors can receive a tax receipt for their contribution. If you like or share this post, your name will be automatically entered into a contest for a full set of all 7 Sgt. Windflower Mysteries. Sent to you or anyone you would like anywhere in the world. Contest runs until December 15, 2018. I will also be donating $5.00 for every copy of Darkest Before the Dawn that is sold in December either in print or online. Final tally will not be available until after Christmas, but that will be another contribution that you can help support to Minwaashin Lodge. It’s time for the 6th Annual Windflower Holiday Book Sale. For the last five years I have been donating most of the profits from the December book sales to a worthy community cause. It’s a great way for me to give back a little to people and organizations who need so much, especially this time of year. In the last five years we have been able to donate over $3,000.00 to community groups who really need our support. We will be doing things a little different this year, so check out the information below as to how you can participate and help this great cause. This year our chosen organization will again be the Minwaashin Lodge in Ottawa. Minwaashin Lodge is a healing centre in Ottawa that provides a range of programs and services to First Nations, Inuit and Metis women and children who are survivors of domestic and other forms of violence, and who may also be suffering the effects of the residential school system. Here’s how you can participate. I have now published seven books in the Sgt. Windflower Mystery Series and each time I have chosen to give away a number of copies, absolutely free. Not only that, but I actively seek out strangers or near strangers on social media to give them away to. Now, I am not giving away all copies of my books. I am neither rich nor daft and I am not particularly altruistic, but I do believe in helping people to read my book. And quite honestly not everyone can afford to buy a book, especially new books. Tons of people are living on a tight budget, on social assistance or on a fixed income because of disability or not being able to work anymore. It’s hard to comprehend in this world of plenty, but twenty bucks is a lot of money if you haven’t got it and one of the ‘luxuries’ that many people give up is purchasing new books. They wait until they are available from the library or get them lent from friends or from the second-hand bookstore. I support libraries, but why do some people have to wait? I realize that I can’t give anybody a raise in their monthly stipend to help them with their book budget, but I can help at least a few of them enjoy my new books, fresh out of the printer’s box. I believe in an idea called Reading Equality, a radically new concept that everyone should have access to quality, new release books. That’s why I am making 25 copies of Darkest Before the Dawn available to people on a low or fixed income. I am advertising this offer on Facebook and Twitter and as the time of writing there are still a few copies left. If you want one or know of someone who could use one but can’t afford it, just message me with the mailing address and I will send a copy in the mail. And yes, I will even sign them. No questions asked. You can send me a message thru Sgt. Windflower Mysteries or Facebook. The links are at the bottom of this post. Of course, if you have the money, I hope you will consider buying a copy for yourself. Maybe even one for somebody you know doesn’t have the cash. Pay it forward. It works for me. And if you want to help get this book into even more hands, ask your local library to order a copy. They’re looking for your suggestions. And if they don’t have the budget, tell them to contact me and we’ll make them an offer they can’t refuse. Books on Beechwood is an independent, locally owned, bookstore that reflects the interests of the surrounding neighbourhoods. The selections on literary fiction, biography, and history are particularly strong. They also have a good selection of mysteries, of children’s books and of cookbooks. The collection of several thousand books in the store is backed by the ability to order from a suppliers list of millions of volumes. They are very involved in the community and host special events such as book signings. They also have their own two book clubs which you are welcome to join. Sleuth of Baker Street is a bookstore that specializes in mysteries, crime novels, detective fiction, Sherlockiana, spy and thriller novels…lots and lots of mysteries…British, American, Canadian…new, used, out of print. If they haven’t got it, they’ll find it. A newsletter worth paying for, and if you want something other than a mystery, they do lots of special orders. Novel Idea is a fabulous locally owned and operated independent book store located in the heart of downtown Kingston, Ontario. It has a great selection of national best sellers and local authors and it’s is both a fan and friend of local authors. Definitely worth a visit if you are in the Kingston area.